While doing some initial fact finding for the Hashimoto’s Protocol book back in 2015, I came across some research suggesting that formaldehyde could have a negative effect on the thyroid gland. This was new information to me, but I was not surprised, as any toxin in great amounts can have an adverse reaction on our thyroid gland, which is our very own environmental sensory gland. However, some people may be ultra sensitive to formaldehyde, even at small levels. I happen to be one of them and thought I would share a bit more about formaldehyde sensitivity, in case others may also be reactive. My first clue that I was formaldehyde sensitive likely occurred when I was in my first year of undergraduate studies, during my gross anatomy lab. The specimens that are used for dissecting are preserved in formaldehyde. (2) I intuitively always had an aversion to dissection and tried my best to avoid classes that incorporated dissecting animals or humans, but anatomy classes with dissection were unfortunately a requirement for becoming a pharmacist. I remember dissecting a fetal pig, and becoming nauseated, having palpitations and a cold sweat coming over my body, then losing color in my face, almost fainting. The instructor removed me from the class and had me sit in the hallway with my head between my legs. The verdict was that I had an emotional reaction. In truth, this made perfect sense, I was really grossed out — the fetal pig looked like a baby — so this could have very well contributed to it. The following year, I had to take human anatomy, and I vaguely remember fainting on the first day of class when we had to walk into the lab. I say vaguely remember, because fainting was a rather common occurrence in my life around that time. Again, the theory was that seeing the cadavers was an emotional experience for me, and of course it was, but studies show that physical reactions to formaldehyde manifest the same way as the “emotional” ones I was told I experienced. I’ve since realized that science is starting to document both short-term and long-term health concerns for science students and biological researchers exposed in labs, as well as funeral home workers using formaldehyde to preserve bodies. But one does not need to spend hours in an anatomy lab to be exposed to formaldehyde… A few years later, I remember going with my mom to a popular furniture store filled with manufactured wood that was treated with formaldehyde and not effectively sealed, so the formaldehyde was constantly off-gassing. I remember feeling anxious and having watery eyes, a runny nose and feeling faint once more. My mom, who had asthma and allergies most of her life, was surprised that I would have this type of reaction. She didn’t smell or sense any problems with the furniture. Formaldehyde is a colorless, water-soluble gas that has a pungent odor (but this may not always be detectable if levels are low). An organic compound made up of carbon, hydrogen, and oxygen, formaldehyde occurs in nature as a byproduct of combustion. (In other words, it can be found in smoke). Formaldehyde-based chemicals are even found in dust clouds in outer space! Small amounts are also produced in living organisms — including animals and people — as a byproduct of metabolic processes such as making amino acids. The Russian chemist Aleksandr Butlerov first synthesized formaldehyde in 1859, and by the late 1800’s it was being commercially manufactured in countries like Germany. In 1907, Belgian chemist, Dr. Leo Baekel, used phenol formaldehyde resin to help him invent one of the earliest plastics called Bakelite. Cut to the present, and it is now widely used in all manner of products and can be manufactured as a solid (paraformaldehyde) or a liquid (formalin). If you have a gorgeous bouquet of flowers on your table and can smell their fragrance, you are inhaling the plant’s airborne molecules. Anything that you breathe in eventually enters the bloodstream, brain, and nervous system. The same happens with chemicals like formaldehyde — whether we can smell them or not. The U.S. Consumer Product Safety Commission has found that formaldehyde is usually present in outdoor and indoor air at levels of at least 0.03 parts per million. Levels in indoor air can vary depending on temperature, humidity, and air exchange rate within the indoor space. Levels tend to go up on hot and humid days and are higher in new homes and offices with poor or limited ventilation. As we spend around 90 percent of our time indoors, this means our formaldehyde exposure may be chronic. In 2011, the U.S. Department of Health and Human Services added formaldehyde as a known human carcinogen to its Report on Carcinogens, which is a science-based, public health report that identifies agents, substances, mixtures, or exposures in our environment that pose a health hazard. The Environment Protection Authority also classifies formaldehyde as a potential carcinogen. Chronic irritation of mucous membranes such as the airways, which triggers asthma attacks and bronchitis. Cellular damage: Formaldehyde is lipid-soluble, which means it can get into your cell membranes, reducing their function and increasing risk of autoimmune disease. Inflammation, particularly in human bronchial cells in the respiratory tract. This is often mistaken for an allergy. Increased cancer risk: This includes cancers of the blood and the lymphatic system. Cellular damage: Research from Brown University shows that formaldehyde may damage DNA and also extensively damage proteins in the nucleus of cells, which could have negative effects on the nervous system. Accumulation of damaged proteins can then cause cells to malfunction and die. This may be why animal studies show that exposure to formaldehyde can interfere with memory, learning, and brain function. Research in rats has shown thyroid changes when rats are exposed to formaldehyde at levels of 5, 10 and 15 mg/kg per day, for just 30 days. Their thyroid gland starts to shrink, suggesting that the formaldehyde is interfering with the synthesis of their thyroxine hormone. In addition, the rats experienced T4 deficiency, decreased T3, and a spike in their thyroid stimulating hormone (TSH). My own response to formaldehyde also highlights just how potent this chemical is. Within minutes of exposure in the lab and the furniture store, formaldehyde triggered my immune system! In short, not only can normal thyroid function plummet due to chemicals like formaldehyde, these toxins may also trigger autoimmune thyroid responses such as Graves’ disease and Hashimoto’s. Elevated TSH has been linked to hypothyroidism and the development of Hashimoto’s autoimmune disease. Furniture and Building Materials – Formaldehyde is found in all manner of building materials, including pressed wood such as plywood, particleboard and chipboard, plastics, coatings, paints, varnishes, resins, finishes and adhesives. Some floorboard materials – even bamboo – may also contain formaldehyde in their adhesives. Insulation materials such as glasswool and rockwool also release formaldehyde into the air, and many older houses have urea foam insulation, which is particularly problematic. In addition, formaldehyde is present in flame retardant chemicals used in computers, mattresses, couches, and the interior of cars. If you build a new home or renovate, the levels of formaldehyde in your home environment usually escalate—even if you opt for eco-friendly paints. Formaldehyde can also contribute to “sick building syndrome” that can occur in office workers.“Energy-efficient” office buildings now often have permanently closed windows, more insulation, cheap chipboard furniture, and fewer air vents so that less air can get in and out of the building. This may help save on electricity or air conditioning costs, but the end result is that you may be constantly breathing in more formaldehyde. The European Union has set legally enforceable limits that there should be no more than 0.2 percent of formaldehyde in products. In the United States, similar guidelines are only voluntary. This is concerning given that even concentrations of formaldehyde as low as 200 to 300 parts per million may trigger dermatitis in sensitive people. It is such a problematic chemical that in 2015, the American Contact Dermatitis Society named formaldehyde the Allergen of the Year. Clothing and Bed Linen – According to the World Health Organization,“formaldehyde-releasing agents provide crease-resistance, dimensional stability, and flame retardance for textiles and serve as binders in textile printing.” This means that formaldehyde is present in clothes and permanent press bed linen, and you may be absorbing it through your skin and when you inhale. Clothes that have high levels of dyes or require constant dry-cleaning also contain higher formaldehyde residue. Research from the University of Louisiana shows that this is an often undiagnosed cause of dermatitis (also known as eczema, which can be characterized by itchiness, red skin, and a rash). Fertilizers and Pesticides – Commercial agricultural chemicals and domestic pesticides such as insect sprays and cockroach bombs often contain formaldehyde, which may leave unhealthy residues in your food, home or workplace. Vaccines – All vaccines contain almost the entire cell of the bacteria or virus you’re vaccinating against… but that’s not all they contain. They also contain an adjuvant, which includes strong chemicals like formaldehyde to alert your immune system that something foreign has entered the body, so it can gather its forces quickly. A growing number of integrative practitioners believe that these formaldehyde doses may then become a trigger for the development of autoimmune diseases, such as Hashimoto’s. Plastic Food Containers – Formaldehyde is used in plastic soda bottles and melamine tableware; and it may also migrate from other forms of plastic food packaging, into foods. Emissions From Heating and Cooking – Unvented fuel-burning heaters such as gas stoves and kerosene space heaters can outgas formaldehyde. Formaldehyde is also emitted by cigarette smoke and exhaust fumes. As a result, you may be breathing in formaldehyde if you warm up your car in the morning, particularly if your garage doorway allows easy access for garage fumes to enter your house. If have a natural gas oven and stove top, your daily exposure may also be higher. Research by Berkeley National Laboratory has shown that when homes don’t use venting range hoods above gas cooktops, the household exposure to formaldehyde and other gases such as carbon monoxide and nitrogen dioxide may exceed benchmarks based on federal and state health-based standards. As women are typically the cooks of the house, their exposure is often the highest. An unhealthy gut microbiome: This may be due to taking many courses of antibiotics or due to a diet high in refined carbs and sugar. Drinking alcohol every day can also increase the level of unbalanced bacteria in our gut. Testing for formaldehyde sensitivity can be done via the Cyrex Chemical Immune Reactivity Array. 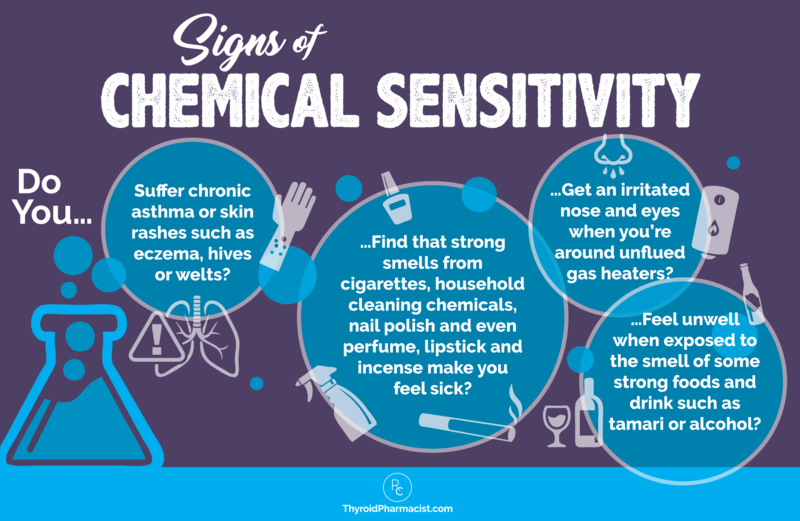 If you are affected by chemical sensitivity, don’t despair – you can get better! 1. Buy organic foods: This will ensure you’re not ingesting chemicals like formaldehyde when you eat. Organic farmers only pick vegetables when they are ripe, which also means they’ll be higher in nutrients. 2. Serve fresh fish: Formaldehyde can naturally occur in marine fish and crustaceans after death, but if frozen, the formaldehyde levels rise even higher. That’s why I recommend eating fresh wild caught fish, preferably from the fish market. 3. Reduce inflammation: Take a big picture approach – minimize stress, maximize good quality sleep, reduce your intake of alcohol, and eliminate and reintroduce foods like gluten, dairy, corn, soy and eggs to see if you are sensitive to them. Take turmeric daily, sprinkled on a latte, in curry, or in a savory breakfast bowl – it is a potent anti-inflammatory spice. You can also eat foods like fish and seeds, which are packed with anti-inflammatory omega-3 fatty acids. 4. Drink dandelion tea: Or enjoy other herbal bitters such as chicory, endive and arugula – they all help stimulate bile production, which in turn boosts liver function. This is important, as your liver is the main organ that helps filter chemicals like formaldehyde from your body. 6. Filter your water: This can reduce the chemical load on your body. My preferred choice is a reverse osmosis filter. 7. Boost gut health: Much of your immune response begins in your gut, so if you have gut issues like bloating or acid reflux, you may be more over reactive when exposed to formaldehyde. To improve gut health, take probiotics, eat fermented foods and use digestive enzymes containing Betaine and Pepsin to help you better digest foods and absorb nutrients. Also minimize use of alcohol and antibiotics, and try supplementing with L-glutamine, which can help heal leaky gut. 8. Support your thyroid with supplements: Antioxidants such as Vitamin C, Vitamin E, beta carotene (a vitamin A precursor), and the minerals Selenium and Manganese are potent free radical scavengers, which help protect your body against the impacts of formaldehyde. Zinc and Selenium can also help improve conversion of T4 to T3, which can be compromised by formaldehyde exposure. 9. Balance acid and alkaline: Processed foods plus meat, dairy, some nuts, and cereals/grains that are high in protein but low in potassium can cause acidity. In contrast, foods rich in potassium but low in protein, such as fruits and vegetables, require an alkaline environment for digestion. They then help create a more alkaline environment, which helps support your liver to detox chemicals. 10. Support your liver: Supporting your liver’s detoxification process can aid with removing toxins such as formaldehyde, and can often reduce the symptoms of multiple chemical sensitivity. Substances that help support liver detoxification include milk thistle, dandelion, amino acids, n-acetyl-cysteine and various vitamins. The Rootcology Liver Support Kit was created to support the body’s natural two-phase detoxification process. This is accomplished by providing the nutrients needed to support and balance phase I and II metabolic pathways, high levels of antioxidants for safe detoxification, and a comprehensive array of herbal hepatics and cholagogues to promote healthy liver function and elimination. Learn more about Liver Support in my article, here. 1. Clean Your Air: When scientists were working on the space shuttle Skylab 3, they found that the indoor air was contaminated with over 100 chemicals. But since plants recycle oxygen, they reasoned that plants might have a hidden talent for breaking down pollutants as well – and they were right. NASA research, which focused on keeping the air for astronauts as clean as possible, has found that plants can do a great deal to remove pollutants from indoor air because they absorb and break down chemicals through their leaves, roots and the micro-organisms in the soil. The NASA studies have found that one potted plant per 100 square feet of floor space is the minimal needed to improve indoor air quality. The plants found to be most effective at removing indoor chemical pollution include dracaenas, bamboo palm, fig species, peace lily, philodendron, chrysanthemums, gerbera daisies, aloe vera and spider plants. These plants are also effective formaldehyde eaters. By placing several varieties of indoor plants in different locations around your home and office, you can enjoy the maximum chemical filtering benefits from your indoor plants. NASA scientists found that by placing aloe vera in a room for 24 hours could reduce the amount of formaldehyde in the air by an impressive 90 percent. More recently, research published in the Journal of American Society for Horticultural Science discussed the formaldehyde-blitzing powers of two types of houseplants: the weeping fig (Ficus benjamina) and the evergreen shrub (Fatsia japonica). The research found that the plants were able to remove 80 percent of the formaldehyde within 4 hours. By comparison, when the same amount of formaldehyde was pumped into the same control chambers with no plants present, the formaldehyde levels naturally decreased by around 7 percent. You can also invest in a high-quality air filter. Air filters that remove VOCs and toxins are essential for removing formaldehyde from the air. I recommend investing in a bedroom air purifier, which can benefit you if you have asthma, breathing or sinus issues as well. I personally have the AirDoctor at home, which removes almost 100 percent of particles, as well as the vast majority of toxic ozone, volatile organic chemicals, and gases. The cleaner the air we breathe, the cleaner our bodies will be, and the easier it will be to heal and stay well. 2. Exercise regularly: This helps your cells to make more healthy proteins which boost the function of the energy centers or mitochondria in your cells, which can be damaged by formaldehyde exposure. High Intensity Interval (HII) workouts can be particularly beneficial. 3. Use natural cleaning products: Look for respected eco-conscious brands that are free of synthetic solvents, detergents and artificial fragrances. Alternatively, make your own natural cleaning solutions using agents such as lemon, eucalyptus oil, baking soda and vinegar. 4. Install a range hood over gas stoves: And open windows when cooking too – this will help reduce some of the formaldehyde released from stove top gas burners. 5. Avoid an overheated house: Put on socks and more clothing layers in winter so you don’t overheat your house. (This will benefit your power bill too). Create additional shade on your home to keep it cooler in the summer by planting deciduous trees near the house and installing awnings and blinds. 6. Steer clear of plastic packaging: Where possible, store food in glass, not in plastic, particularly if the food contains acidic ingredients, such as tomato or fatty ingredients which can cause greater leaching of chemicals. Avoid washing recycled or reusable plastic drink bottles at high heat; reheating and reusing plastic bottles may cause the plastic to break down and leach more chemicals into the liquid. Use glass drink bottles and earthenware, or china cups and plates. In addition, when buying take-away coffee, bring your own mug to avoid drinking from polystyrene cups. 7. Open windows to air rooms and leave doors ajar in order to create a cross breeze. Ceiling and portable fans can help increase the airflow so you get better air exchange – which means you more effectively encourage the stale air to be circulated out of the house. 8. Choose clothes carefully: Consider second-hand clothing – older clothes have been aired and washed more often, so they will contain less chemicals. When buying new clothes, choose fabrics that are not drip-dry and don’t require dry cleaning. Wash garments several times before wearing. Also, choose more untreated natural materials such as hemp or unbleached cotton, which, in most cases, are produced using fewer chemicals and pesticides. 9. Avoid flu vaccinations: Instead, support your body with adequate doses of Vitamin D, proper nutrition, and hygiene. 10. Use low VOC materials when building, renovating or repainting. These usually come from eco-conscious companies that keep the amount of Volatile Organic Compounds (VOC), such as formaldehyde, low in their products. This means you can go for low VOC carpeting as well as low VOC underlay, paints, plywood and adhesives. 11. Avoid prefabricated furniture: These kinds of cupboards and shelves are usually high in chemicals like formaldehyde. Instead, make your own storage units using natural wood or purchase options from eco-friendly retailers. If that means you need to save up, get some second hand options to tide you over, as these will contain less formaldehyde simply because they are older and have already outgassed some of their chemicals. In addition to avoidance and proper liver support, some people find that desensitization protocols can be helpful. This is best done under the guidance of a functional medicine practitioner who will provide you with microscopic doses of the offending chemical until your body learns not to see it as a threat. Depending on your unique sensitivities, complementary therapies provided by integrative practitioners, including low dose immunotherapy, sublingual immunotherapy, NAET and homeopathy, have been reported to be helpful in reducing formaldehyde and other types of reactions. Acupuncture may be helpful as well. 1. Low dose immunotherapy – Low dose immunotherapy is a form of immunotherapy that uses a tiny dose of the enzyme beta glucuronidase, with very minute doses of various food, pollen or chemical allergens, to stimulate the production of T-suppressor cells (T regulator or T reg cells). The theory behind this is that it switches off helper cells that identify these particles as threatening allergens. This technique, which claims to have no side effects, reprograms the immune response to promote immune tolerance. It has been used in the treatment of autoimmune disorders, as well as allergies, asthma, and chemical sensitivities. In one study, low-dose immunotherapy was used to treat formaldehyde sensitivity. The results concluded that low-dose immunotherapy may affect baseline levels of intracellular calcium in lymphocytes (by reducing the lymphocytic intracellular calcium ion concentration). In other words, it suggested that this therapy can indeed help to promote more normal immune cell signaling in those with allergies. 2. Sublingual immunotherapy – Sublingual (under the tongue) immunotherapy involves creating a dilution of an allergen that one is sensitive to, and administering dosages under the tongue to promote tolerance to the substance in question. The treatment is considered safe and effective for those with multiple chemical sensitivities. In a study where 35 patients of various age groups and both genders were given self-administered sublingual neutralizing doses of formaldehyde 3 times a day, 34 people reached recovery or remission. Given that the majority of patients responded favorably to this method, the study concluded that sublingual immunotherapy can be an effective method of desensitizing those with chemical sensitivities, including formaldehyde, although results may vary within individuals, and recovery could take over 5 years to achieve. 3. NAET – NAET (Nambudripad’s Allergy Elimination Techniques) is a non-invasive technique that reverses allergies by using acupressure (gentle pressure on acupuncture points) in conjunction with exposure to one’s allergen. You can find out more about this technique, as well as local practitioners in your area who may offer NAET treatments for formaldehyde and other chemical sensitivities, on the founder of NAET’s website. 4. Homeopathy – This form of alternative medicine, developed by Samuel Hahnemann in 1796, is based on the idea that any substance that can cause illness can also be a cure. In other words, if a substance causes a symptom in healthy individuals, giving someone a tiny amount of the same substance may cure his or her condition. Homeopathic preparations are made by repeatedly diluting substances in distilled water or alcohol, to the point where no molecules of the original substances remain. However, it is believed that the trace amounts left behind are active and are sufficient enough to desensitize the body to the original substance(s) in the remedy. Although this therapy has been considered highly controversial by conventional doctors, it is widely used around the world as an effective and gentle treatment for many conditions and allergies. I recommend consulting a homeopathic practitioner in your area to inquire about formulas available for formaldehyde sensitivity. 5. Acupuncture – Originating from Traditional Chinese Medicine (TCM), this form of holistic health care involves practitioners that stimulate specific points on the body, by inserting thin needles on various areas on the skin. Although it involves needles, it is a relatively pain-free therapy used to treat a variety of health conditions as well as pain. Acupuncturists believe that stimulating acupuncture points on the body helps to balancing the “flow of energy or life force” throughout the body, which can become stagnant or imbalanced, resulting in illness. Thus, this therapy claims it can assist with allergies and sensitivities as well. Are you sensitive to formaldehyde or other chemical substances? What has helped you to reduce your chemical reactions? P.S. To learn more about other helpful interventions for thyroid disease and tips on reducing your exposure to toxins, please consider picking up a copy of Hashimoto’s Protocol: A 90-Day Plan for Reversing Thyroid Symptoms and Getting Your Life Back. For continued updates and interaction, please become a part of our Facebook community and sign up for my newsletter to have helpful information delivered right to your email inbox. You’ll also receive occasional updates about new research, resources, giveaways, and more. 14th Report on Carcinogens. National Toxicology Program. https://ntp.niehs.nih.gov/pubhealth/roc/index-1.html. Published in 2016. Updated January 10, 2018. Accessed March 26, 2018. An update on formaldehyde: 2013 Revision. US Consumer Product Safety Commission. https://www.cpsc.gov/s3fs-public/pdfs/AN%2520UPDATE%2520ON%2520FORMALDEHYDE%2520final%25200113.pdf. Published in 2013. Accessed March 26, 2018. Ortega-Atienza S, Rubis B, McCarthy C, Zhitkovich A. Formaldehyde Is a Potent Proteotoxic Stressor Causing Rapid Heat Shock Transcription Factor 1 Activation and Lys48-Linked Polyubiquitination of Proteins. Am J Pathol. 2016;186(11):2857-2868. doi: 10.1016/j.ajpath.2016.06.022. Brent GA. Environmental exposures and autoimmune thyroid disease.Thyroid. 2010;20(7):755-61. doi: 10.1089/thy.2010.1636. Muncke J, Myers JP, Scheringer M, Porta M. Food packaging and migration of food contact materials: will epidemiologists rise to the neotoxic challenge? J Epidiomol Community Health. 2014;68(7):592-4. doi: 10.1136/jech-2013-202593. Kim KJ, Kil MJ, Song JS, Yoo EH, Son KC.Efficiency of Volatile Formaldehyde Removal by Indoor Plants: Contribution of Aerial Plant Parts versus the Root Zone. J Am Soc Hort Science. 2008;133(4):521-526. Robinson MM, Dasari S, Konopka AR, Johnson ML, Manjunatha S, Esponda RR, Carter RE, Lanza IR, Nair KS. Enhanced Protein Translation Underlies Improved Metabolic and Physical Adaptations to Different Exercise Training Modes in Young and Old Humans. Cell Metab. 2017;25(3):581-592. doi: 10.1016/j.cmet.2017.02.009. Perna, R. B., Bordini, E. J., & Deinzer-Lifrak, M. A case of claimed persistent neuropsychological sequelae of chronic formaldehyde exposure: clinical, psychometric, and functional findings. Archives of clinical neuropsychology. 2001;16(1), 33-44. Haffner MJ, Oakes P, Demerdash A, Yammine KC, Watanabe K, Loukas M, et al. Formaldehyde exposure and its effects during pregnancy: Recommendations for laboratory attendance based on available data. Clin Anat. 2015 Nov;28(8):972-9. doi: 10.1002/ca.22623. United States Environmental Protection Agency. 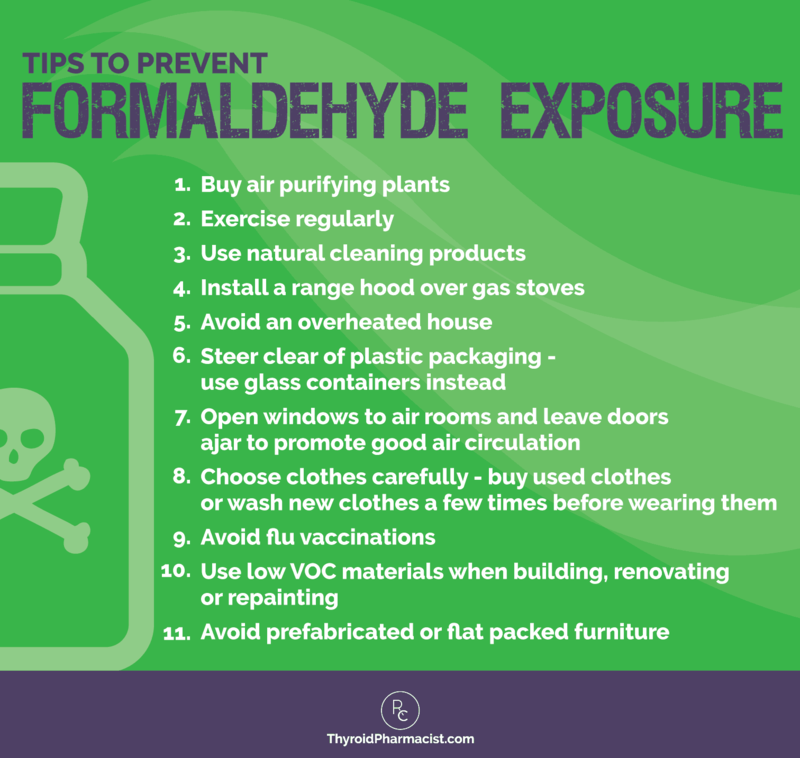 Facts About Formaldehyde. https://www.epa.gov/formaldehyde/facts-about-formaldehyde. Published on June 15, 2017. Accessed on December 13, 2017. Medical Research Council. Toxic formaldehyde is produced inside our own cells, scientists discover. https://www.mrc.ac.uk/news/browse/toxic-formaldehyde-is-produced-inside-our-own-cells/. Published on August 17, 2017. Accessed on December 13, 2017. Patil S, Premalatha B, Rao RS, Ganavi B. Revelation in the Field of Tissue Preservation – A Preliminary Study on Natural Formalin Substitutes. Journal of International Oral Health : JIOH. 2013;5(1):31-38. National Institute of Environmental Health Sciences. News release: New Substances Added to HHS Report on Carcinogens. https://www.niehs.nih.gov/news/newsroom/releases/2011/june10/index.cfm. Published on June 10, 2011. Accessed on December 13, 2017. Lu Z, Li CM, Qiao Y, Yan Y, Yang X. Effect of inhaled formaldehyde on learning and memory of mice. Indoor air. 2008;18(2):77-83. American Contact Dermatitis Society. History of Allergen of the Year. https://www.contactderm.org/i4a/pages/index.cfm?pageid=3467. Published 2017. Accessed December 13, 2017. Sotelo C, Piñeiro C, Pérez-Martín R. Denaturation of fish muscle proteins during frozen storage. Z Lebensm Unters Forsch. 1995;200(1):14-23. Wolverton BC, Johnson A, Bounds K. Interior Landscape Plants for Indoor Air Pollution Abatement, Final Report. https://ntrs.nasa.gov/search.jsp?R=19930073077. Published 1989. Accessed April 5, 2018. Castro M. The Complete Homeopathy Handbook.New York, NY: St. Martin’s Press; 1990. Hauswald B, Yarin YM. Acupuncture in allergic rhinitis: A Mini-Review. Allergo Journal International>. 2014;23(4):115-119. doi:10.1007/s40629-014-0015-3. Thank you so much for this. Wow, what a lot of research and information. Invaluable info and learned a lot. Omg, never suggest avoiding a flu vaccination! Flu vaccination is the one thing you can do to keep yourself and others with compromised immune systems healthy and alive. Lana – thank you for sharing your concerns. I cannot give you any straightforward guidance about vaccinations and we each have to make our own informed decision about this. As a pharmacist, I certainly think that vaccines can save lives. I can also tell you that there’s no drug on the market that doesn’t have any side effects. It’s quite plausible that a vaccine, which introduces a foreign invader and an infection, even though it’s a deactivated infection, could set off the immune system in the person with the right genetic predispositions and perhaps some other things going on within their body that can trigger autoimmune disease through a mechanism known as molecular mimicry. Molecular mimicry is an autoimmune theory that states we develop autoimmune disease because there’s a bug or an infection within our body that looks like our thyroid or another part of our body. The immune system starts to attack the infection and anything that looks like it. Now, it’s possible that some of the vaccines, and particularly some of the inactivated infections within the vaccines, might look like the thyroid gland or they might look like another part of our body. I agree with Dr. Wentz, that the flu vaccine, while it is a personal choice, is not essential. Lana- if you have a totalitarian view on “never suggest avoiding a flu vaccination! Flu vaccination is the one thing you can do to keep yourself and others with compromised immune systems healthy and alive.” You really should include more background information in your statement. For example, You say it’s the ONE thing you can do… but that’s not accurate. Dr. Wentz clearly suggested other avenues for healthy flu prevention like supplementing with Vit. D. and exercise. And while no one likes the hard work of regular exercise it really does make a valuable impact on your health. Not only that, but in immunocompromised individuals, flu shots have not shown a 100% success rate. Don’t get me wrong, I hate getting the flu. No one likes being sick, but many people survive the flu with their lives intact. Personally, I think playing the long-game with healthy everyday choices is preferable to getting the flu shot and introducing unnecessary chemicals into your body. I don’t like the idea of taking the easy way out with my body and I do not like relying on a company to make the best decisions for me. Thank you, Dr. Wentz, for the very thorough and informative article. You obviously put a lot of time into it. I really appreciated this article, if I might add one item, there is a trend amongst people who abuse substances to lace any number of things with phormaldehyde. I’m not certain all the negative effects but it seems to affect the brain. I’m sure there’s something on PubMed but I seem to recall Phormaldehyde inducing brain bleeds. Hilary – thank you so much for your support! I appreciate you sharing this. Dear Izabella, thank you for your articles, so detailed and so generous and explicitly written. Hello Dr. Wentz, I thoroughly enjoyed your article and learned many things. I have been diagnosed with Hashimoto’s Thyroiditis but it seems more like I have Grave’s because I continually battle with the symptoms of hyperthyroidism . . .can you suggest a protocol for hyperthyroidism as well? Lynn – thank you for reaching out and sharing your journey. <3 Graves and Hashimoto's are both autoimmune conditions that affect the thyroid. They are thought to be closely related. Sometimes one turns into the other. The difference is the site of the antibody attack. In Hashimoto's, the antibodies are found to thyroglobulin (in 80%) and thyroid peroxidase (TPO) enzyme (in 95% of people) Hashimoto's results in hypothyroidism and is usually treated with Synthroid and replacement hormone. I always use reverse osmosis filtered water for all of my cooking and beverages. Unfortunately the reverse osmosis also removes all of the nutritionally important minerals like magnesium that would otherwise be present in the water. To compensate for this, after filtering I always replace the lost minerals by adding back in ConcenTrace concentrated mineral water, which I can buy off the shelf at my local health food store. Great info but I don’t have the time to sit and read it all. In addition because of my very acute fatigue I would fall asleep which happens very often when I sit but I can listen to videos while doing my meals, etc. Is your info available on U-Tube? Thank you so much for this information! 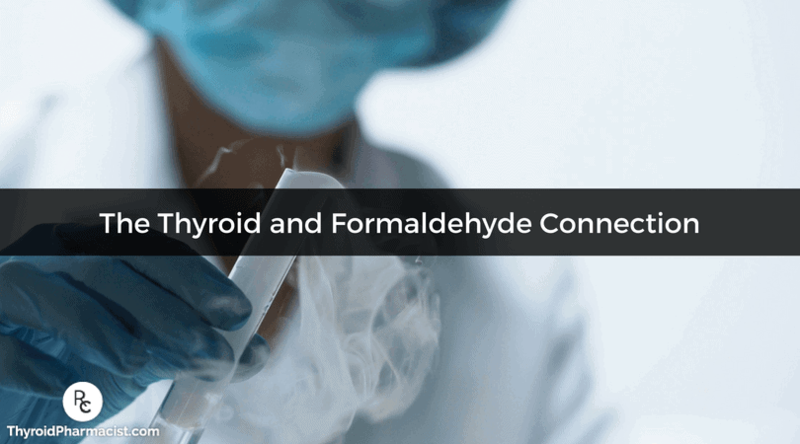 I have been searching for information on the relationship between formaldehyde and thyroid. I regrettably had the Brazilian blowout treatments done regularly for almost 5 years before educating myself on the potential formaldehyde exposure. I now have been trying to conceive for over a year and was recently diagnosed with Hashimoto’s and high FSH and low AMH at the same visit. Is it possible to reverse the impacts of formaldehyde exposure on fertility and thyroid? Thank you again! It’s a good idea to reduce your exposure to toxins in your environment. A few ideas include the use of an air purifier, drinking filtered water, stopping the use of cosmetics that contain petrochemicals, avoiding preservatives and additives, stopping the use of harsh cleaning agents and aerosols, and eliminating molds in your home. I have also found N-Acetyl-Cysteine, a supplement that supports liver detox capabilities, to be worth considering. I have a whole chapter on detoxification in my book, Hashimoto’s: The Root Cause and I cover liver support in great detail in my new book Hashimoto’s Protocol. You can also read about how supporting the liver is key to recovering from thyroid disease. You’ll find signs and causes of toxic overload, how liver impairment is related to Hashimoto’s, who is most at risk, and so much more. Hi Izabella! I just started your liver reset and found this article. I’ve heard that aspartame (nutrasweet) turns into formaldehyde when heated. Whatever the case, I drank Crystal Lite every day for 20 years, sometimes drinking it hot! Yikes.